Green Web Hosting: Initiative for Eco-Friendly Alternatives. As an initiative for the promotion of green eco-friendly alternatives to traditional phone books and print directories, YellowPagesGoesGreen.org (Yellow Pages Directory Inc.) takes an added initiative to minimize the impact we have on the environment with our own computers, servers and web hosting services. We believe this sets the best example and invite you to participate with your own business. Data centers are major contributors to energy consumption and carbon emissions, accounting for more than one percent of total electrical use within the U.S. 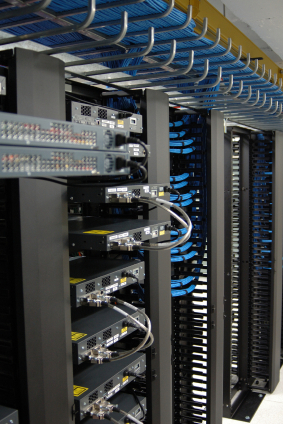 The typical hosting operation requires a great deal of energy to power web servers and other network equipment. Environmental and cooling controls, fire-suppression systems, electronic security mechanisms and Internet connections all call for the use of energy. This is the setup in data centers all over the world, and you can image the negative affect the hosting industry has on the environment. The world has a fixed amount of resources - some of which are already depleted. So as population growth greatly strains our finite resources, there are fewer resources available. If we intend to leave our children and grandchildren with the same standard of living we have enjoyed, we must preserve the foundation of that standard of living. We save for our children's education, vacations, and weddings, but what about saving clean air, energy, water, fuel sources and trees for future generations? Yellow Pages Directory Inc. feels confident that hosting our servers with Rackspace® Hosting, (NYSE: RAX) on GreenSpace web servers takes an additional step toward a cleaner tomorrow. Rackspace designs all of its data centers with power conservation in mind and leverages the latest energy efficient hardware and equipment. Access to reliable, affordable and renewable energy is critical to delivering Fanatical Support® to customers. Rackspace thinks about Energy the same way it thinks about Sustainability --holistically: People, Pocket and Planet. Each year Rackspace increases its renewable energy by five percent per year until its reaches 100 percent. In 2014, Rackspace consumed 40 percent renewable energy. The company's investments are focused on renewable energy certificates (RECs) in the US and Levy Exempt Certificates in the UK. Conservation: It incorporates energy conservation and efficiency into decision-making in the way it builds, buys and operates. Renewables: Its goal is to reliably and affordably power all of its operations with renewable energy. Advocacy: its goal is to insure that its partners are in alignment with its goals around energy conservation and renewable energy. Headquartered in San Antonio, TX, Rackspace operates more than 30 MW across 9 data centers on four continents. Rackspace’s award-winning Fanatical Support® helps customers successfully architect, deploy, and run their most critical applications at scale. Rackspace is featured on Fortune's list of 100 Best Companies to Work For and has been listed on the Dow Jones Sustainability Index for 2012 and 2013.